This FAQ is meant to provide a very brief overview of Buddhism, along with links to other articles that provide more information. Many of the questions were submitted to me in the Buddhism forum or by email. Please feel free to send or post additional questions. 1. Who was the Buddha? 2. What did the Buddha teach? 3. Is Buddhism a religion or a philosophy? 4. If Buddhists don't worship Buddha, why are there so many Buddha statues? And why are offerings made to them? 5. If Buddhists don't worship like other religions, why do they have temples, scriptures, monks and priests? 6. What are the different branches of Buddhism? 7. Are all Buddhists vegetarian? 8. Do all Buddhists believe in reincarnation? 9. What do Buddhists think about various social issues such as abortion, capital punishment, war, and poverty? 10. How does someone become a Buddhist? According to Buddhist scripture, the Buddha was a spiritual teacher born as Siddhartha Gautama, an Indian prince, sometime around 500 B.C. The major Buddhist branches each tell slightly different versions of his life story, and historians have not been able to validate any particular version, but according to all of them he left home as a young man to pursue spiritual truth. He studied the major teachings and practices available at that time, and found them all either too indulgent or too punishing. He achieved enlightenment through what he called 'the middle way', and went on to teach this way for fifty years before his death. His life story and teachings were at first passed down orally, then in written form, and became the foundation for what we now call Buddhism. The Buddha was not a God, nor is he considered a prophet or messiah. He was a teacher, and taught that anyone could achieve the realizations that he did through their own efforts. 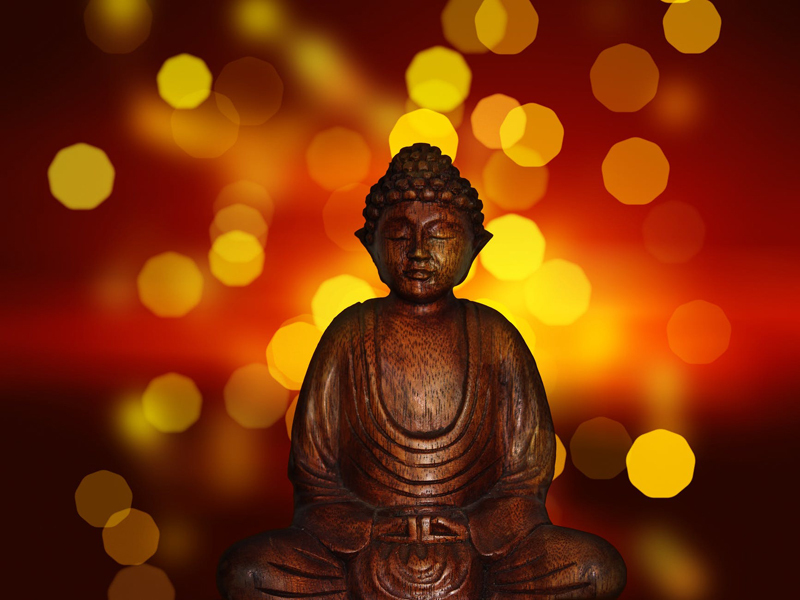 The word 'Buddha' is also used to refer to other teachers - both men and women - who have achieved enlightenment. The original Buddha is sometimes referred to as Shakyamuni Buddha to distinguish him from other Buddhas. Put very briefly, the Buddha taught a way out of suffering. The foundation of his teachings are the Four Noble Truths, his discoveries regarding the nature, origin, and cessation of suffering. The Fourth Noble Truth lays out the EightFold Path, the Buddha's teachings on how to free ourselves from the the cycle of suffering. Central to the Eightfold path is the practice of meditation, of which there are many forms. When speaking of suffering, or dukkha, the Buddha was not only referring to experiences that we find painful. He was also speaking of the transience of pleasurable experiences, and our false belief that we can find happiness by seeking out pleasure and averting pain. Because everything is impermanent, we can never gain lasting happiness from these efforts. True happiness is found by freeing our mind entirely from this addiction through the EightFold Path. 3. So is Buddhism a religion or a philosophy? Because Buddhists do not worship a God or gods, some people do not consider it a religion. However, it is usually classified as a religion by scholars, and a large one at that - by some estimates as many as 500 million people practice Buddhism worldwide. However, many Buddhist practitioners consider it more of a toolset for living than a religion, and increasingly, especially in the West, individuals combine Buddhist practice with other religious beliefs. The Dalai Lama, spiritual leader of Tibetan Buddhists, has often said that individuals from any religion that feel drawn to Buddhism do not need to convert, suggesting that they can combine Buddhist practices such as mindfulness and meditation with their current religious faiths. In general, Buddhism is not a proselytizing faith, and Buddhists do not organize missions or engage in other conversion-oriented activities. Although the Buddha originally requested that no idol be created in his image, over time some schools of Buddhism modified this view, and Buddha statues and paintings are now prevalent. In fact, within some schools of Tibetan Buddhism, creating mandalas and other sacred art that incorporate images of Buddha is itself considered a form of Buddhist practice. However, bows or offering made to these statues are not considered forms of worship, since the Buddha is not considered a God. They are instead a way of paying respect, and a form of spiritual practice designed to generate humility and appreciation. Incidentally, the laughing, big-bellied Buddha statue often seen in the West is actually not of the original Shakyamuni Buddha, but instead is Hotei or Budai Buddha, a popular figure in Chinese, Japanese and Korean mythology, who many believe is based on an actual sixth-century Chinese Buddhist monk and teacher. Some Buddhist branches do have temples, and priests, while other don't. For those that do, priests often perform ritual functions such as weddings and funerals that are associated with priesthood in other religions. In some traditions, they also conduct rituals associated with Buddhist holidays or festivals. But these rituals evolved within different Buddhist cultures over time, and are not part of the broader core teachings of Buddhism. Priests or other figures that perform these functions are usually also Buddhist monks; most, but not all, Buddhist branches maintain a strong monastic tradition. However, much more universal to Buddhism is the idea of a teacher, and a sangha or spiritual community. The Buddha described the Three Jewels of sangha, dharma (the teachings), and Buddha (the teacher) as refuges any Buddhist could derive guidance from. Buddhism is still primarily an oral tradition, meant to be passed from teacher to student. Depending on the branch of Buddhism, a teacher might be either a monk, nun, or a lay person. As for scripture, there are thousands of Buddhist texts considered to be canonical by Buddhists, but branches differ on which texts they consider primary, and many also have texts specific to their tradition. The most universal are the sutras - teachings originally given orally by the Buddha, and later written down. 6. So what are all the different branches of Buddhism? Mahayana Buddhism developed several hundred years after the Buddha's death, and incorporates the idea of practicing for the liberation of all beings. This idea is most purely expressed in the idea of a Bodhisattva, a being who forsakes their own ultimate liberation in order to aid all others along the path. Zen, Tibetan, Nichiren, Pure Land, Shingon and Tendai Buddhism are all Mahayana Buddhist schools. Each Buddhist school differs in their practices, hierarchies, and scripture. All have both monastic and layperson traditions. The monastic traditions are distinct between each school, with varying monastic vows, rituals and dress. However, all schools of Buddhism accept the Four Noble Truths and EightFold Path as foundation tenets. No, although many are. Most Mahayana Buddhists are vegetarian, while dietary practices vary within Theravada and Vajrayana Buddhist schools. Vegetarianism stems from the Buddha's teaching on the five precepts of ethical conduct, the first of which is not to take a life. In Mahayana Buddhism, vegetarianism is also seen as compassion practice, which extends beyond simply abstaining from meat. Many argue that we should also consider the sources of our food, and any harm that results indirectly from its production. Non-vegetarian Buddhists point to the fact that being alive inherently involves harm to other beings, whether directly or indirectly, and that the primary goal should be not to take more than we need, therefore causing harm beyond what is absolutely necessary for our survival. These are just a few examples of arguments raised for and against vegetarianism by Buddhists; this is in fact an ongoing debate with many variations. Actually, the Buddha taught the doctrine of rebirth, not reincarnation, and this was one of the defining differences between his teachings and those of his contemporaries. Reincarnation implies the migration of a soul, an intrinsic impermeable self, from one physical form to another. Buddhism teaches that there is no irreducible self, but instead a constantly changing set of mental and physical components called the five aggregates or skandhas. Buddhist practice, particularly meditation, is meant to help us realize the nature of the skandhas, thus freeing us from the delusion of self and cycle of rebirth. Buddhists as a whole do not have an organized, universal position on any social issue, because no governing body exists. However, most contemporary Buddhist teachers have expressed the view that abortion does violate the first Buddhist precept to not take a life. However, in general Buddhism strongly advocates personal responsibility and does not support universal moral proscriptions, so many of these same teachers have also said that they do not support laws outlawing abortion. And it is worth mentioning that some Buddhist traditions, especially in Japan, have not taken an anti-abortion stance, believing it to be entirely a personal decision. The debate is largely the same regarding capital punishment, and killing as part of a war. In general, they both clearly violate the first precept, but Buddhism allows for moral deliberation, and some teachers do believe violence is sometimes necessary, particularly in defense of human rights and the dharma. This debate has particularly arisen in relation to oppressive regimes within Buddhist countries, such as Myanmar, where some Buddhist activists have expressed the view that change will not occur without some violent action. As for poverty and social injustices, Mahayana Buddhists tend to believe that aiding others is an intrinsic part of Bodhisattva practice, although there are no uniform Buddhist political or social positions. Thich Nhat Hhan, a Vietnamese Zen Buddhist monk who has become very well-known in the West based on his books and teachings, has coined the phrase 'engaged Buddhism' to refer to social and political work on behalf of others as part of Buddhist mindfulness and compassion practice. I undertake the training rule to abstain from taking life. I undertake the training rule to abstain from taking what is not given. I undertake the training rule to abstain from sexual misconduct today. I undertake the training rule to abstain from false speech. I undertake the training rule to abstain from drinks and drugs that cause heedlessness. Exact interpretations of what each of these precepts means in daily life vary from school to school (as in the debate over vegetarianism and the first precept, mentioned above.) Those entering monastic orders take additional vows that vary from tradition to tradition as well. But although some branches emphasize the importance of monastic life more than others, enlightenment is considered a possibility for anyone, monk or lay person, within them all.